Since my column from two weeks ago, I’ve been to Japan and back. Preceded by my sister, I went to join her to celebrate our mother’s 84th birthday. I figured this might be a good time to again break format as far as writing only about media-related issues with regard to Asian Americans and Asians and just convey some impressions about my first visit there in almost six years. “The Japanese smoker is becoming an increasingly rare breed. According to a new survey, 21.7% of Japanese adults are smokers, the lowest proportion recorded since the annual report conducted by Japan Tobacco Inc. began in 1965.” Bam. One of the odder sights was a smoking area at Haneda Airport. It was basically a small, enclosed room with a sliding glass door where nicotine addicts could get their fix. It looked kind of sad. Thank goodness also that common sense has finally prevailed and the roundtrip ANA flight was nonsmoking. Hard to believe there was a time when international flights allowed smoking. Babies and the Elderly: Yes, Japan has plenty of “silver citizens” (my folks included) and the number is growing. Once again, it was purely anecdotal, but I also observed many younger people, too — primary school age, college age, young and middle-aged adults, despite the statistics. Also saw visibly pregnant women and many infants and toddlers. Perhaps it was because my parents reside in what’s been described as a “bedroom community” in suburban Tokyo, where families would tend to live. It was good to see some people trying to buck the trend of Japan depopulating. But at the same time, why all the fuss about the declining populations in Japan, S. Korea and China, as well as in Northern and Western Europe? Just a few decades ago, it was the “overpopulation nightmare.” Shouldn’t this side-effect of prosperity, which is a natural form of birth control, be considered a good thing? There’ll be robots to take care of us in 30 years, right? Food: Japan has great food overall, and if you like Japanese food, it’s the best. I tried to watch my caloric intake but still ate pretty well; I told my sister that I was afraid I’d get back home, get on the scale and see that I’d gained five pounds. She said I might be surprised. When I checked the scale after returning, I weighed one pound less than when I left, presuming it’s accurate. The temperature was warm to hot while I was there, and I probably walked more than normal. I also tried to watch the amount of white rice I ate, but was a bit distressed that I couldn’t exercise like my usual routine. There is something interesting going on when one can eat more in Japan than here and lose weight. 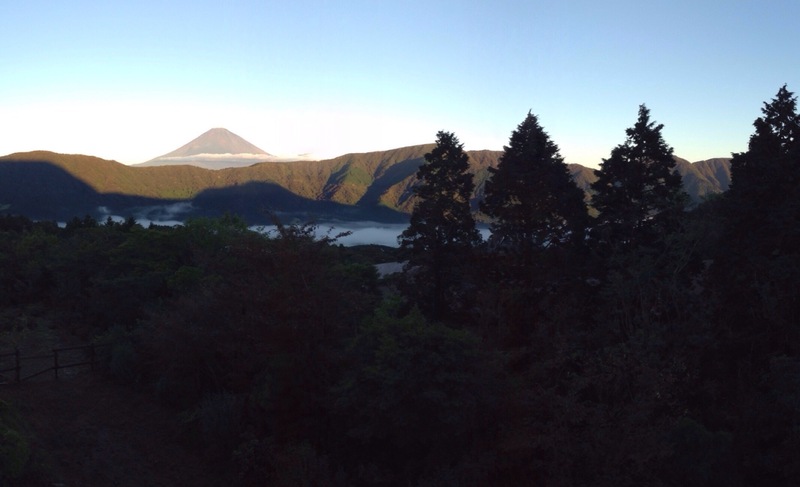 This is a shot of Fujisan that I took from a hotel window in Hakone. Weather: It was drizzling and cloudy the day I arrived. Then it proceeded to get downright warm, hot at times. Autumn weather really was on hold while there. Then we went to Hakone and the weather got cloudy and rainy. The next morning, however, I opened the hotel room’s drapes and sliding door and was stunned by the best view of Fujisan I’d ever seen, a real once-in-a-lifetime vista of clear, cloudless blue morning sky and a snowless Fuji in the distance. Within a couple of hours, Fuji was obscured by the clouds. Later, as my sister, dad and I trekked about Hakone, it clouded up and it began to drizzle. The next day, as we descended to return to the Tokyo area, the sun came out and it got hot and stayed that way. Being outdoors at night, though, was perfectly pleasant. Autumn is my favorite time to be in Japan. Glad I missed Typhoon Wipha. Line to get into the Pokémon Center in Hamamatsucho. The store was packed and the line to purchase so long, it snaked out of the store into the hall of office building before snaking back in. The things we do for our kids. Shopping: Not only is the food great in Japan, the shopping is amazing. Really marvelous merchandise, truly a shoppers’ paradise. I don’t mean big-ticket items necessarily, although you can get that sort of thing if you can afford it. For example, while I didn’t make it to Akihabara I did what I considered the next best thing, which was visiting Yodobashi Camera in Shinjuku. I found a great little battery testing device that was better than anything I’d seen at Fry’s or Radio Shack. Also, having the exchange rate at about ¥100 to $1 made it easy to figure out how much I was spending. Cashier line to make purchases at the Pokémon Center. Tourists: I saw and heard tourists from all over. Despite tensions between governments, I heard plenty of Chinese and occasionally Korean being spoken by tourists. Also saw plenty of white Westerners from here and Europe, as well as some black folks from here and, I imagine, Africa, too. Japan is probably more tourist-friendly now than ever. Cool Ideas: There are always cool ideas from Japan, and this one was literally cool. Maybe this has been around a while, but I saw for the first time in a supermarket: coin-operated refrigerated lockers, not unlike the coin lockers at train stations and airports. The difference: These keep your stuff cold. Brilliant idea. If you’ve ever been grocery shopping and then realize you need to get something else but can’t because you have to get home to refrigerate something that’ll melt or go bad, then you know how handy this idea is. This might work even better in the U.S., where space for refrigerated lockers might not be at such a premium. Possible cool idea for an entrepreneur to try here. Reference to Last Column Dept. : To those who asked for an MP3 from the JACL PSW award lunch, I haven’t forgotten!